The happy scene in NC Governor Pat McCrory’s office yesterday as he signed the bill rejecting billions in federal Medicaid dollars for the poor under the Affordable Care Act. 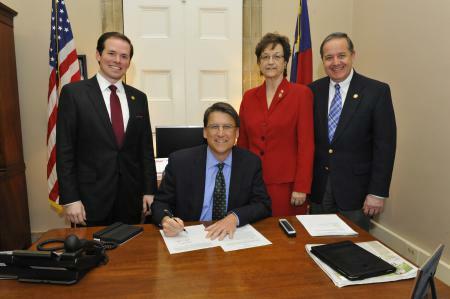 From left: Rep Justin Burr (R-Montgomery, Stanly); Governor Pat McCrory; Rep Marilyn Avila (R-Wake); Rep Mark Hollo (R-Alexander, Wilkes, Yadkin). Not sure what the point of this post is. A large portion of the population gets healthcare from their employer (supposedly a central tenent of Obamacare). Since all of these people are employees of the state, then they are eligible for the health program. What gives? All these people in the photo provide services and get the benefits of state employees. Now your 500,000, they will be getting the benefits when the Feds set up a program on their own accord. Or are you saying the progressives setting up the system are uncaring enough to exclude these 500,000? That can’t be! Obamacare was to take care of all of us! Maybe you need to direct your vitriol to President Barry for excluding these poor 500,000 and letting them fall through his crack. . I think the story should be titled, “4 people trying to protect the financial future of our state”. Proving there is no shortage of ignorance in the North Carolina state house and governor’s office. Doug, your reasoning defies logic. That is the comment I would expect from you dave. Logic is something you have to experience in order to judge. Doug , you’re always whining about waste, these people are part time employees, except for DAG McCrory, there for, they can pay for their own insurance like everyone else and save the tax payers some money. You guys are always whining about people need to have all the free healthcare they can get, so I don’t understand your argument. It is very circular. Look, the Dem majority of the past 140 years set up for state employees to have generous healthcare benefits. Now progressives are against it. Very hypocritical if you ask me. I can at least see these people have a job and are contributing to society rather than taking from it They may not even be on the state system depending on if their full time job provides insurance…it is a bit presumtive of the blogger to assume so. Doug just has trouble dealing with the grins on the faces in that photo! Doug, damaging society is no contributing to it. This is true, that is why the ones who have damaged NC are not in power any longer. Now we just have to do the same to the Dems in DC. Jack, hahahahahaha! Always enjoy your comments. I applaud our governor for not allowing our state to go into further debt over the Patient Protection and Affordable Healthcare Act. This act is not in anyway affordable. It is unconstitutional and every state should reject any part of it.